Large sized dogs need their snuggle space too. That’s why it’s important to take your time when crate shopping to ensure you find the best large dog crate that offers features perfect for your pup. With large dog breeds, even giant fellas like those Great Danes and Mastiffs, there are certain qualities to keep in mind that make choosing a solid crate imperative (ahem, physical strength). That’s why we’ve created a post to help you understand the large dog crate market from bottom to top. You’ll learn how to make mindful choices, what sets crates apart, the features that you absolutely need and how to decide on the perfect size. We’ll do you one better, doggie comrades! We’ve done the research and listed 30 large and giant dog crates on the market that we feel offer pet owners amazing quality at fair prices. It’s time to get caged! Which Breeds Need a Big Boy Crate? Is Your Dog a Large Size Breed? Is Your Dog an XL Size breed? Just like you, your doggo is a beautiful, unique little snowflake. No single crate fits the needs of all. The first step to crate shopping is brainstorming questions such as: why do I want a crate? How big is your dog? This is one of the most important factors when choosing the right crate. Otherwise, if it’s too small, she won’t be comfortable and may develop negative feelings towards it. If it’s too big, she may turn a corner of the kennel into her own indoor toilet. Check out our size guide if you need help. Are you planning on buying a crate for a puppy? With a small pup, you can save money by investing in a large crate that comes with a divider. This is a hard panel that allows you to section the crate. That way, your puppy can grow with the same crate and you can keep giving her more space as necessary without having to buy larger kennels down the road. If your dog suffers from separation anxiety or claustrophobia, You’ll want to take great care. Stress can lead to destructive behavior and your dog might become dead-set on escaping. Believe it or not, when left to their own devices for long periods of time, some determined doggos can open locks and bust through wire without a problem. A heavy duty crate for large dogs is one way to thwart this behavior. Do you live in the hot tropics or the cool North? Whatever the climate may be, remember that your dog will spend ample time enclosed in a box. Some crates are better insulated than others. 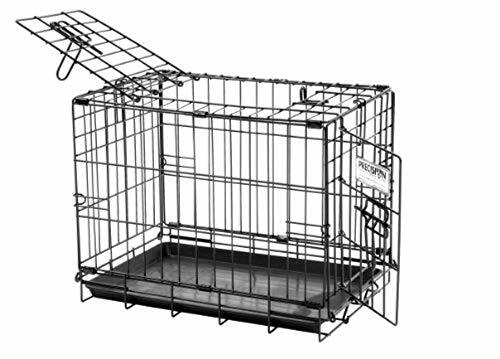 For example, an open wire crate offers more ventilation than a hard plastic crate with air holes. If you plan on flying with your large dog, keep in mind that if she weighs over 20 lbs, she will be required to travel in cargo. For cargo, a hard plastic crate is mandatory. There are many other requirements outlined by IATA when it comes to the best airline approved pet carrier. Make sure you follow up with your airline company beforehand to avoid any complications. There are tons of gorgeous kennels to choose from. Overall, they’ll fall under soft crates or hard crates. These are the main types we will review and rate. Wire metal crates: This type of crate is usually less expensive than other materials. They come in large and giant dog sizes too. Wired crates are recommended for crate training puppies and big dogs with a mild-mannered temperament, but not for dogs that like to escape. Plastic crates: This type of crate is highly durable, yet less ventilated than wire crates. It’s important to ensure there are air holes on all sides of the kennel. This type of crate is required if you plan to fly. 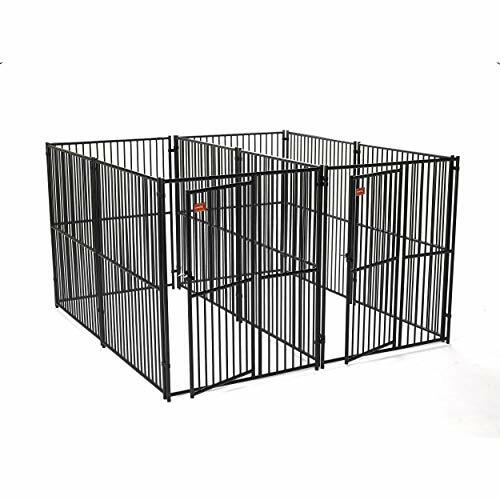 Heavy duty crates: This type of crate is more expensive, but offers an indestructible kennel designed to accommodate destructive or escape artist dogs. Soft-sided crates: features fabric soft sides supported by a wire frame. 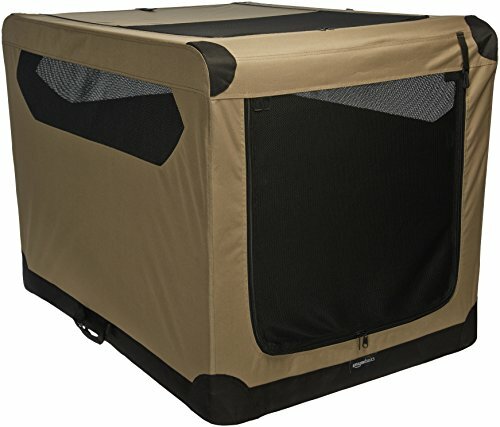 If you’re an avid outdoors person that likes to bring Fido along for the hike or camping trip, this kennel is built for lightweight convenience, comfort and easy fold-up portability. Fashion crates: This type is all about style. It is made from wood or wicker in a tasteful design to complement your home. Some of these crates double as an end table or other pieces of furniture. 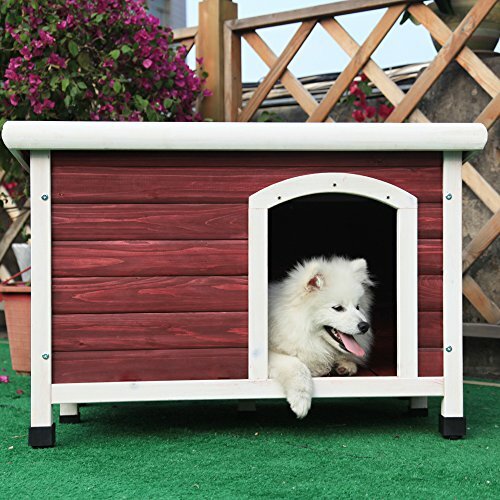 There are even beautiful outdoor wooden dog houses that let your pup relax outside in their own den. They are not recommended for crate training or destructive dogs. Here’s a video that showcases some common types of crates. It’s the little things that can sometimes make a blase crate extra-great. In our opinion, these are the most useful features that make owning a crate easier. Storage pockets on soft-sided crates for supplies. Small dog crates are one thing, but large dogs need a crate that can handle their strength and size, especially XL sized dogs. If your dog weighs between 71 to 90 lbs (32 to 40 kg) and ranges from 23 to 26 inches (58 to 66 cm) in height, then we recommend a 42 inches (107cm) dog crate as the best size. If your dog weighs between 91 to 110 lbs (41 to 49 kg) and ranges from 26 to 28 inches (66 to 71 cm) in height, then we recommend a 48 inches (122 cm) dog crate as the best size. 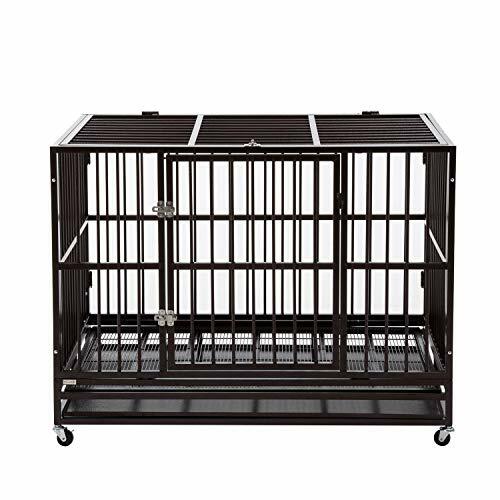 If you have a puppy or a large dog that is ready for crate training, this is a reasonably priced wire crate that is built strong with two large doors (side and front) that slide to lock. The divider is great for a puppy, so you can buy one large size and let her grow with the same crate without having to spend money on a new one. We do not recommend this crate for dogs with separation anxiety or escape artists. The lock bolt only slides into place with no latch, so we can see it is easy to bust out if tampered with. 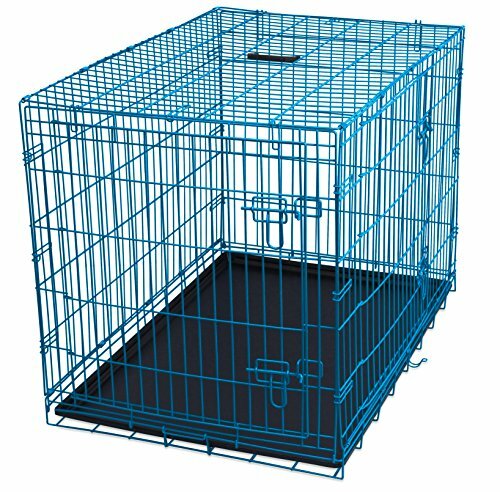 This is a standard wire crate for a puppy or a large dog that is ready for crate training. It offers a nice amenities package, especially if you have a large breed puppy that will triple in size and you only want to purchase one crate for its lifetime. The divider is sublime! 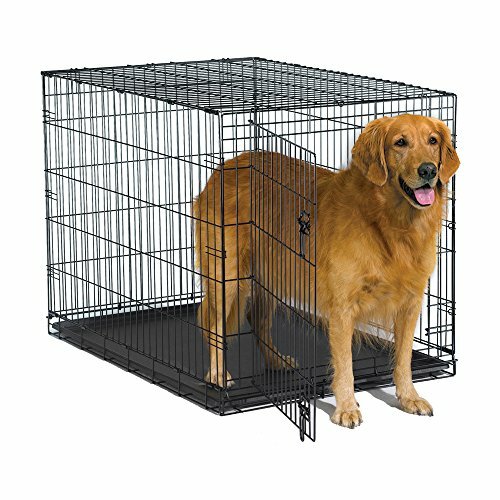 We do not recommend this crate for dogs with separation anxiety or escape artists. For the price, the quality of the materials used for the construction could be finer. The plastic cleaning tray is thin, making us worry if it will withstand hot temperatures. If you’re looking for something on the cheaper side, this wire crate is as basic as it gets without sacrificing quality. We recommend it for crate training or even if your dog is already trained. The double lock system adds extra security for doggos that try to finagle a way out. The plastic pan that slides underneath is a bit loose, which we can see an excited dog being able to kick out. An easy solution would be to zip tie it in place and then it won’t go anywhere. 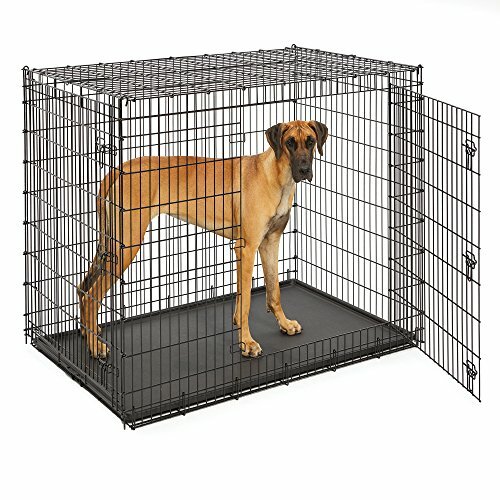 For those extra big dogs out there, this mammoth wire crate is for you! Exceptionally made with a patented “L” bar construction on the top of the crate reinforces the structure so the bars do not bend inward. A door is placed on top so it is easy to access with food dishes. We do not recommend this as the best portable dog crate for large dogs. Due to the size and weight, portability isn’t the easiest, even if you just want to move it around a room. You’ll want to have plenty of space available as well. The construction on this large dog crate is plenty durable. They took care when ensuring the metal wire frame was built solid and the locks secure snugly at 5 key points on the crate. It comes with a divider panel for puppies, so no need to worry about buying multiple crates over the years. We love this one because it’s basic and the quality is excellent. It covers all of the bases for a lasting crate that can be used for both puppies and large dogs. 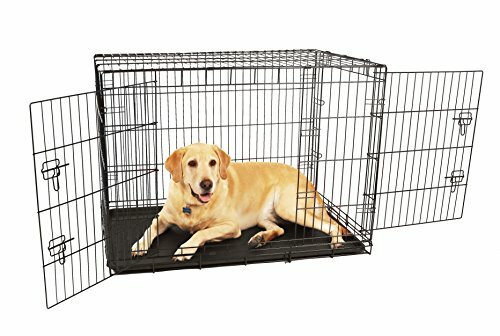 This is a nice, basic wire crate suitable for adult dogs and large breed puppies. 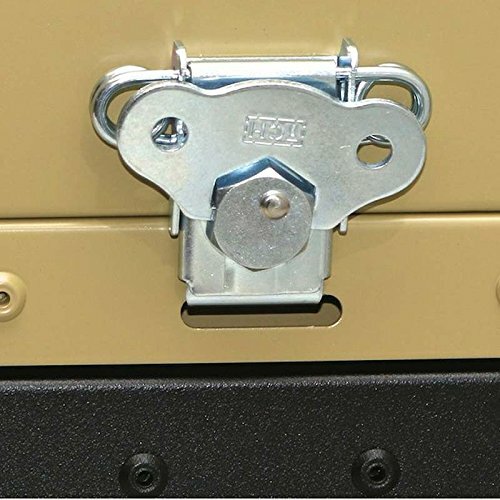 The wire construction features rounded, smooth corners for safety and a sturdy double lock latch system. What we loved most is how simple it is to assemble this crate for transport. The design and quality are reliable, but we would not recommend this for Houdini dogs, as the door seems easy to manipulate if worked on by an especially diligent pup. 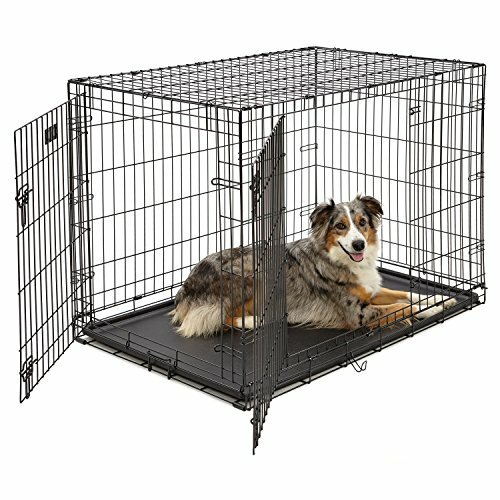 We chose this well-crafted steel crate for those out there looking for a clever 2 dog option without nixing quality. The design is simple, yet thick bars and welded edges make for a strong structure that holds up well against large dogs. The spacing is quite ample between bars though, and without a top or clean up tray, we do not recommend this for puppies. The only other “eh” we had was the expensive price. Even though it houses 2 dogs, it’s still pricey, considering the lack of features. This is a budget crate where you get what you pay for. If you’re looking for a heavy gauge metal crate, this one is on the lightweight side. With that being said, the price is affordable for a large, versatile crate. 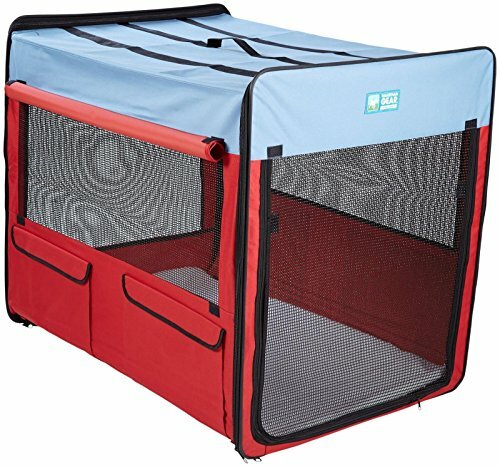 It’s excellent for puppies and dogs crate training due to the inclusion of the divider panel and cleaning tray that slides underneath. We loved that this company includes a brochure with helpful crate training tips, as well as access to a 20-minute online course. This is a budget-friendly wire crate option that doesn’t skimp on quality. The design was carefully considered, and clean up tray sports a liquid-resistant coating, which makes it a cinch to clean up. 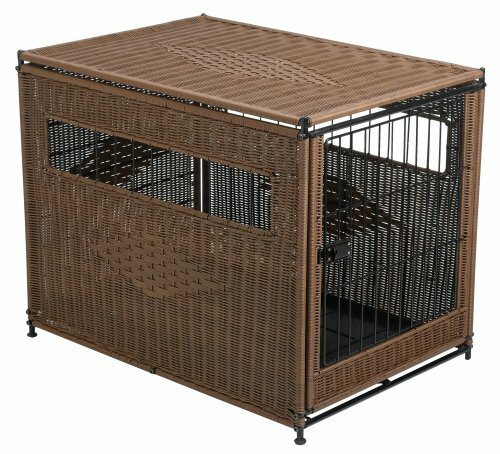 The price is great for a basic crate built for puppies or well-behaved dogs that don’t try to escape. It’s made for safety and comfort with a unique design that keeps safety and durability in mind. We liked this crate for the budget appeal and the fact that you get steel wiring for durability. No doubt, this is a well put together crate that is easy to assemble and can handle large dogs. It’s also incredibly spacious. We noticed that the edges are a bit sharp though, which can lead to injury. Also, the bottom tray isn’t very thick, prompting fears of future cracking. If you’ve got a Houdini pup on your hands, this indestructible dog crate lives up to its reputation for strength. The steel bars are thick and bolted together with screws. The top loading door is a nice touch, making it easy to access a dog that might otherwise try to squirm out of a side door. The bottom tray is a bit rough, so we recommend laying a pad down for comfort. Also, the locks are stronger than your typical slide latch lock, but we can see an escape artist being able to work this system open eventually, as it’s a bit flimsy. 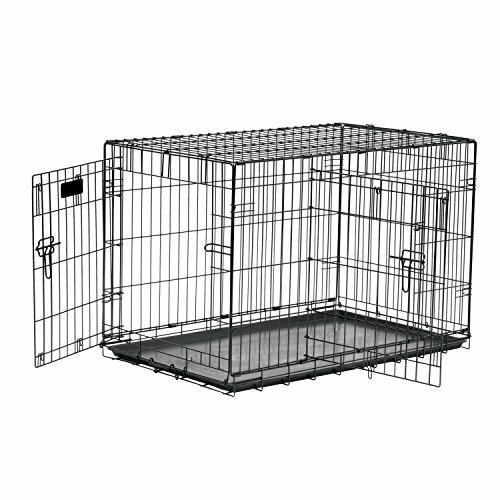 This is one of the strongest dog crates with wide steel bars and 3 doors for convenience. The top is handy for getting past a tricky pup without worrying about her springing out. 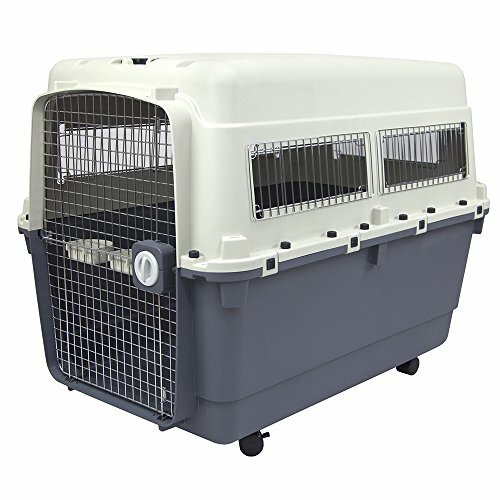 Overall, this is a good heavy duty crate for escape dogs, from a company known for producing excellent heavy duty crates. It keeps things functional without too many extras, just what matters when you need your Houdini dog to be safely contained. You’ll have to break out the big bucks, but you get what you pay for. 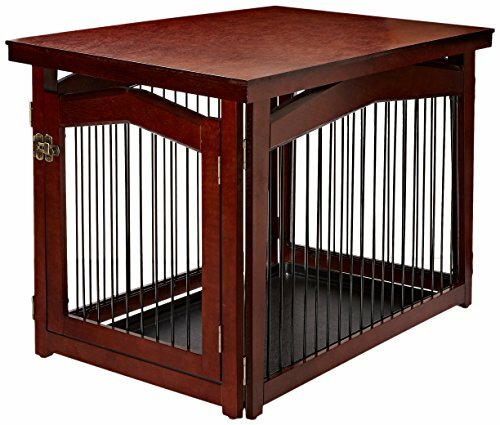 If you have a dog that is a top-notch escape artist or suffers from extreme stress that leads to dangerously destructive behavior, this is an excellent high anxiety dog crate. It’s all about the quality. The construction is like a tank, with solid aluminum walls that minimize spaces and corners to prevent a dog from breaking through or chewing. Also, it works well for transport if you travel with your dog frequently. It breaks down in 8 minutes and is easy to carry with conveniently located handles on the top and sides. 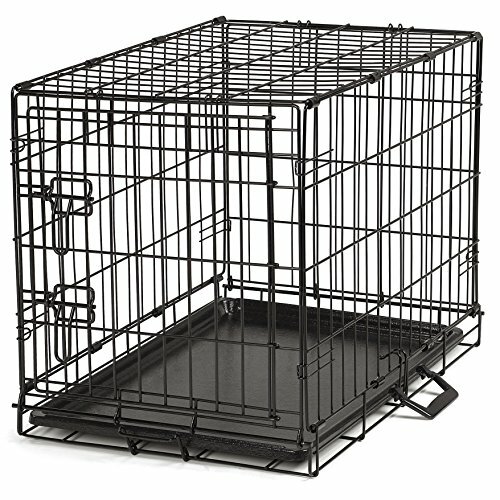 Basic yet sturdy, the steel bar construction of this crate is a nice budget option if your dog likes to escape. The steel construction is solid and the featured cleaning pan and wheels make it convenient. We don’t recommend it as a high anxiety crate though. Our reason: the latches are a bit loose. They don’t slide through all the way and we feel they wouldn’t hold up against a relentless chewer or cage shaker. 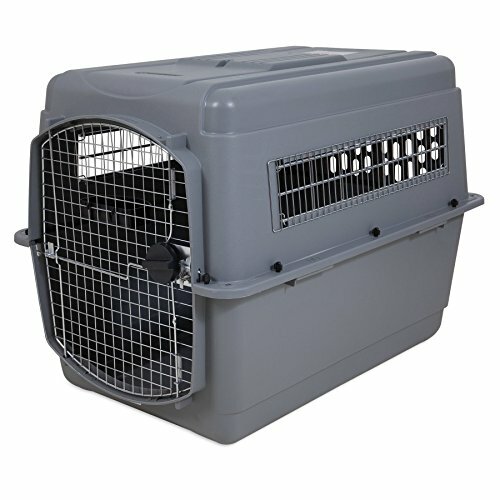 Keep in mind that soft sided crates are recommended for travel and well-trained adult dogs. They aren’t geared towards crate training or escape doggies. With that being said, this soft crate is excellent when it comes to quality. It’s constructed with 600D fabric and hex mesh fabric. The walls are well-ventilated with wide mesh windows to ensure steady airflow and cooling. 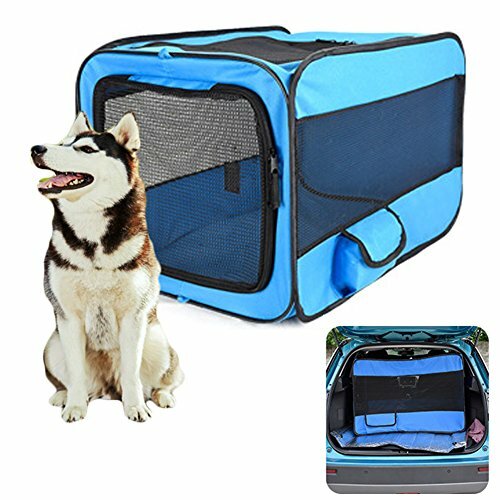 We love the features of this one, making it one of the best collapsible large dog crates. It’s easy to fold up and carry, with options for storage. This crate is another excellent travel option that is easy to fold up quickly without any tools. It’s also one of the cheaper soft crates on the market. We loved the giant mesh windows that can be rolled up to give doggo an open shelter to enjoy the view when you’re camping. On the flip side, the actual door flap is not as tall as the crate, so despite the interior being extra spacious, your dog will have to get used to ducking down as she enters. The bottom is hard and the bed pad is thin, which doesn’t bode well for comfort. If that bothers you, then we suggest investing in another sleeping pad, such as a Sherpa-lined bed that will keep your dog warm on those cold nights. This is a solid crate that stands up sturdy and sports smooth, rounded corners to treat your car interior with care. Spacious and open, the wide mesh windows offer excellent ventilation. The fabric seems a bit thin, which we fear could lead to easy tears. It does feel sturdy though for the price it could come with some storage pockets (but it doesn’t). If you’ve got a St. Bernard, then this colossal soft crate is one of the best soft giant dog crates for sale. It offers some of the smoothest ventilation we’ve seen for kennels, with giant mesh panels that almost cover the entire sides. Since it’s an extra big crate, don’t expect it to be as lightweight as other models. Also, the sheepskin mat is thin. We found it was a bit cheap in quality and didn’t offer much comfort, but that’s an easy fix with your own padding. 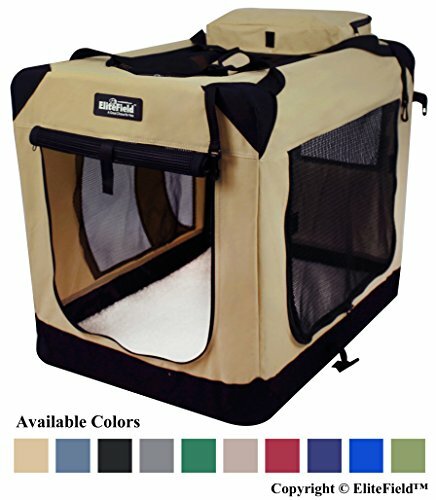 Here’s a sturdy XL soft dog crate pick! 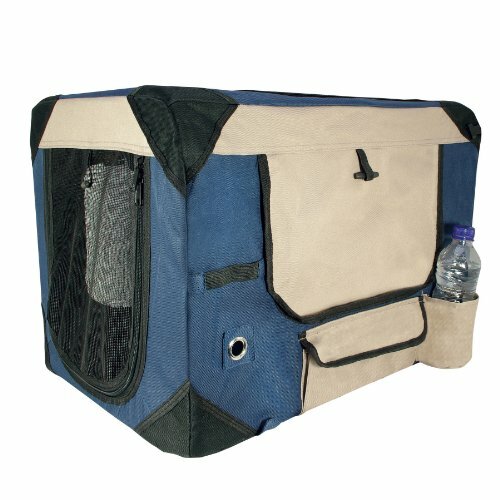 It’s basic for a soft-sided crate, but if you travel a lot and have a well-behaved pooch, this will do the trick. It comes in a spacious box shape with a single zip front door. 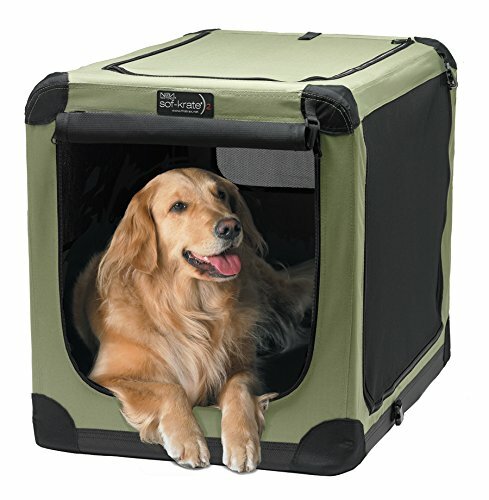 Mesh windows cover the sides, front, back and top, so you know your dog will get plenty of airflow. The threading is loose and it looks like it could come undone easily with a few curious sniffs and nose bumps. We love this strong and well constructed soft crate. The quality speaks for itself, with tightly woven fabric walls and large mesh windows that are sewn together with precision. There is a top door for easy access and you can fold this baby down in less than a few minutes. It’s a bit pricier than other models, but if you travel a lot and need something durable- this is the one. This rugged soft crate is an outdoor enthusiasts dream. The quality is top notch and the ventilation is a top feature. The walls are woven from 600D waterproof Oxford fabric, which makes for easy clean up and quick drying prowess. Large, mesh panels cover all sides for ample ventilation. It’s also built for car travel with gentle rounded corners and seat belt loops. This is another great budget option if you don’t want to dish out tons of moola and your dog is well behaved. The biggest perk of this crate is the ease in which you can fold it down and build it up again for convenient portability. The downside is the quality. Now, we do feel it is a sturdy structure that will do the job of containing your dog in the car or while camping, but the zippers seem a bit weak, so be careful when pulling them down and go at it slowly. We also felt that the mesh windows on the sides could be bigger for more ample ventilation. 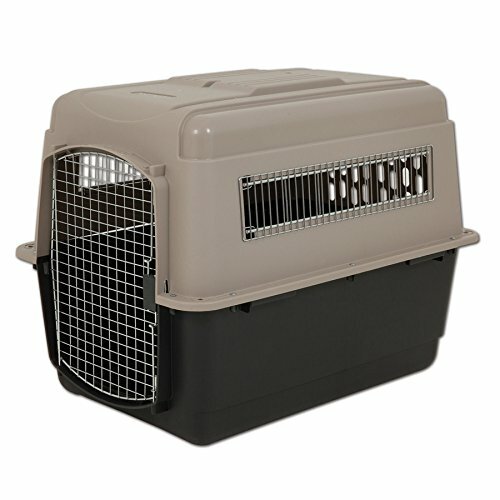 For air travel, especially international, this thick plastic crate meets almost all requirements issued by IATA for pets. The quality is on point, sturdy and durable with thick steel bars. The solid plastic is thick, but the walls offer enough ventilation on all 4 sides to ensure your dog gets enough cool air. If you plan to fly with this crate, keep in mind that metal blots and zip ties are required to ensure crates are securely shut. This model comes with plastic bolts, so you’ll need to replace those yourself. A nice touch we appreciated was that holes specifically for zip ties are already on the crate. 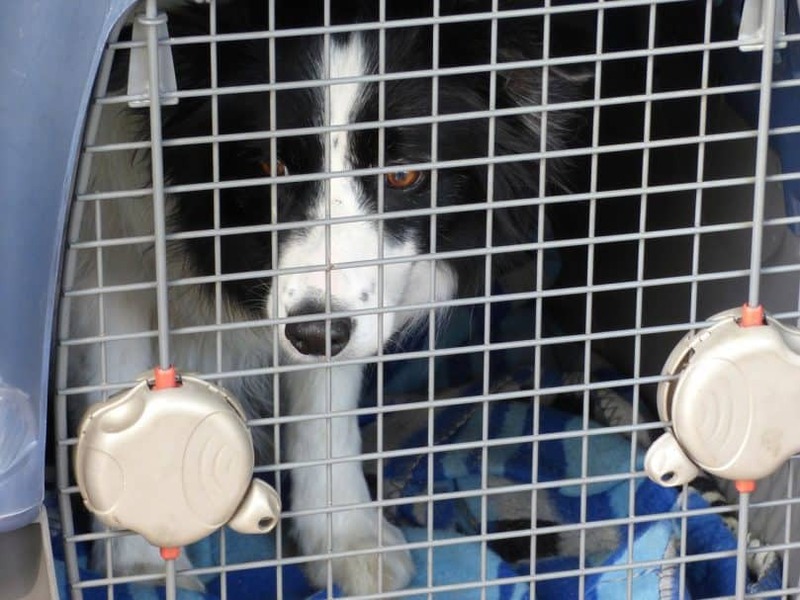 This is another crate to consider if you plan on taking your dog on an airplane. However, you should still confirm if it meets all specific guidelines of your airline company beforehand. You’ve got it all with this plastic kennel and more. It’s durable and well-ventilated. What we really loved was the ease of portability. 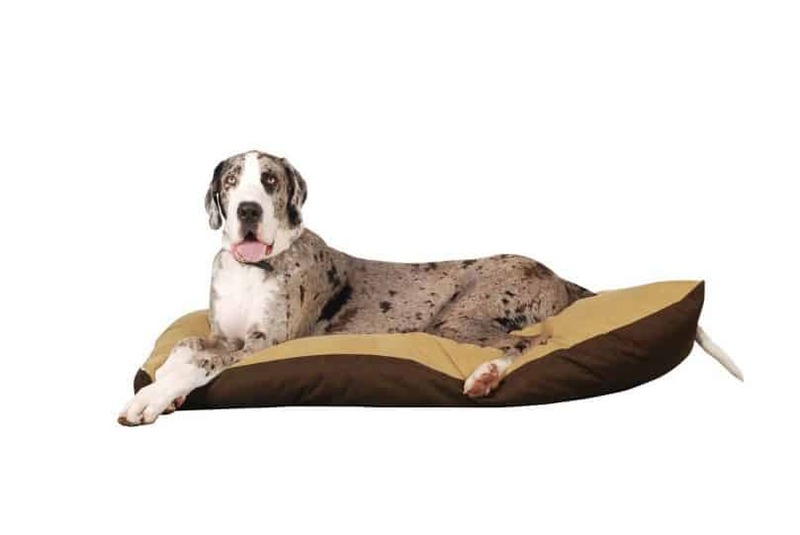 The wheels make it a breeze to maneuver a large dog around and they can detach when needed. It was difficult to assemble it though, and we realized that if it isn’t done right then malfunctions occur easily, like the wire door popping off. Here is our favorite budget option for hard plastic crates. The price is cheaper than other similar models, but then again it lacks key features such as wheels and carrying handles. We don’t recommend this as an airline approved crate, as the sides of it are ventilated, but not the back wall. 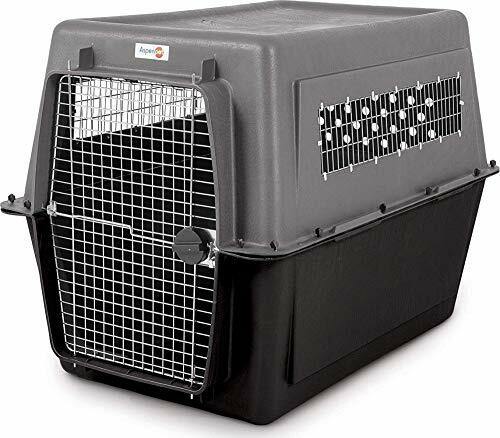 The crate is sturdy though and will offer your pet a secure abode if you are traveling by car or prefer a solid plastic crate instead of wire for home use. This plastic crate is functional with the typical bells and whistles, such as air holes on the sides and a metal door and can be used for air travel (if approved by your airline company). The solid walls create a den-like atmosphere that can promote calmness, but it doesn’t do much to stop scratches on the thin plastic. For the price, the build could be a bit more durable. This beautiful mahogany wood crate is top quality, with craftsmanship that shows attention to detail. The assembly was a cinch. All we had to do was align the hinges, drop the pins through and voila. It’s a solid crate with style as the priority, so don’t go for it if you’ve got a puppy or escape trickster. This can be unfolded to be used as a gate and you can place it at the end of a sofa to be used as an end table. This isn’t your everyday run-of-the-mill kennel! In fact, this is an old-school dog house. 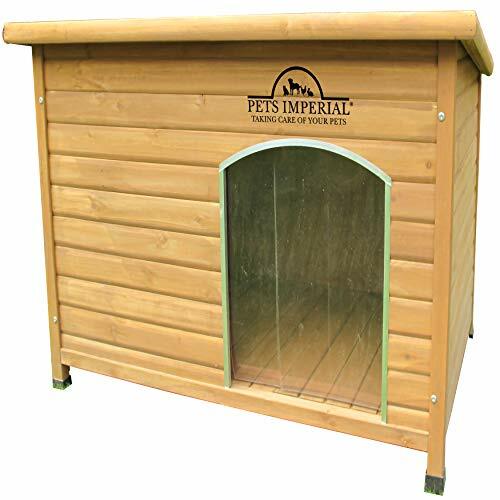 For large dogs that enjoy a den-like atmosphere when hanging out in the fenced-in backyard, this is a roomy option that is made from kiln dried cedar. The quality is excellent, as the solid wood walls are not complicated to assemble. The roof is slanted to accommodate rain. A thought went into the construction, as the door is more off to the side to give more sheltered space to your dog when it rains. Of course, this might not be the best indoor option and it doesn’t come with any special features, but it’s definitely a dog house we believe even Snoopy would approve of. Solidly built, the thick wood walls of this dog house get a 100% for quality and outdoor longevity. The design is simple, yet tasteful for any outdoor setting. We love the insulated walls that will keep your dog warm during the winter and cool during summer. Please note that it will not withstand an avid chewer. The door features flaps that can be tempting to chew as well, but they can be removed if desired. This is a beautiful and unique crate made entirely of wicker and metal wiring. It offers pet owners a uniquely bold dog crate system that will have your friends oohing and ahhing. The quality is excellent, with top-of-the-line craftsmanship. But keep in mind that this crate is about style and not functionality. The metal construction is heavy, making portability a bit trying. Also, dog hair tends to get stuck in the wicker, although it is easy to clean with soap and water. The floor is not flat but slightly raised due to the wicker and metal bar design. This might be uncomfortable for some dogs, but nothing a padded bed can’t fix. Finding the perfect crate all boils down to what suits the needs of you and your fur baby. We gave you a long list of reputable crates to get you started. Now, let us leave you with our No. 1 favorites for each category. 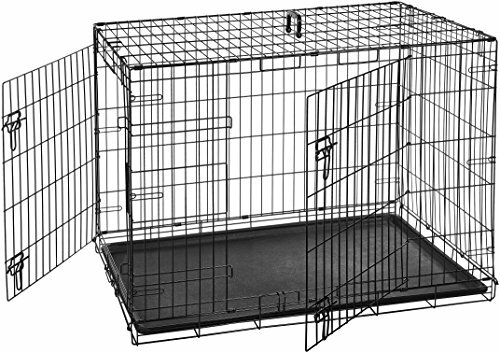 The Midwest Homes For Pets Dog Crate is a long time favorite, constantly ranking at the top as a quality wire crate. 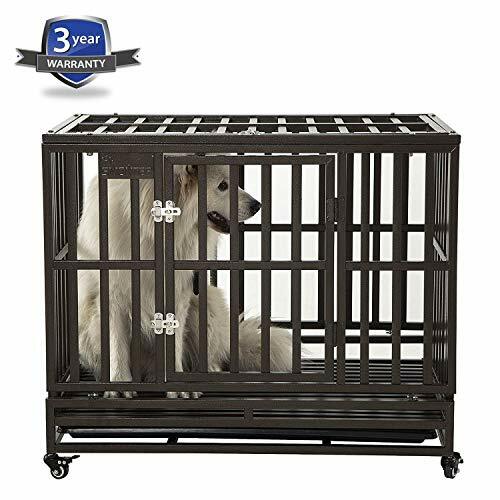 It’s a good all-around option whether you’re looking to crate train or need a reliable option for a puppy or adult with the perfect amount of useful features. 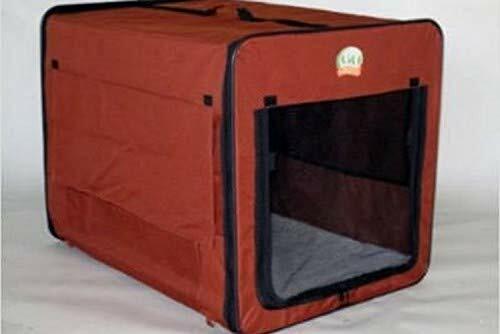 When it comes to heavy-duty crates the LUCKUP Heavy Duty Dog Cage is a winner. 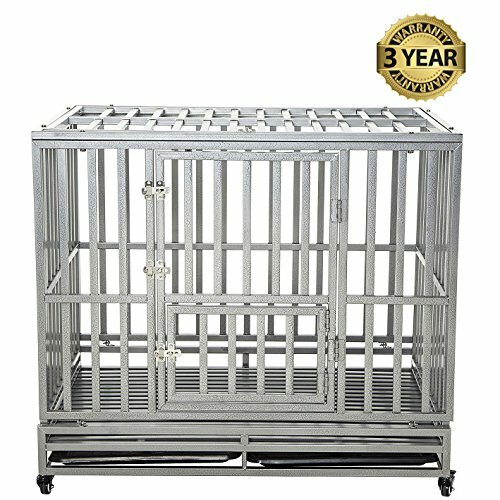 Its unique design of solid aluminum walls, a single metal wire door, and heavy lock make it difficult for avid chewers and escapees to have any loose bars, space or knobs to work with. 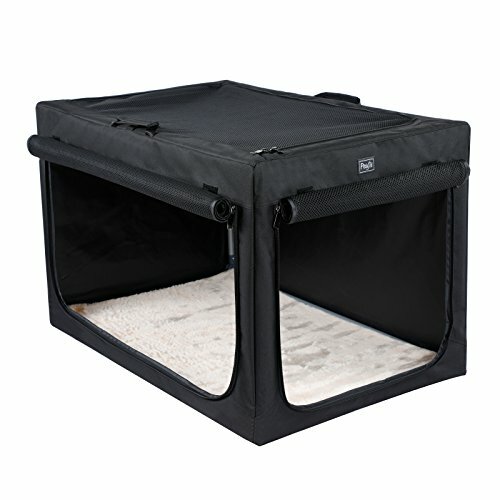 Travel has never been easier with the EliteField 3-Door Folding Soft Dog Crate, which is a durable soft option that is lightweight, well-ventilated and folds up like a dream. For plastic crates, the Petmate Sky Kennel meets most airline requirements for flying and is known for excellent quality craftsmanship. Finally, the Merry Pet 2-in-1 Configurable Pet Crate is a beauty if you’re into a stylish large dog fashion crate. The beautiful wood finish adds an elegant touch to any living room.